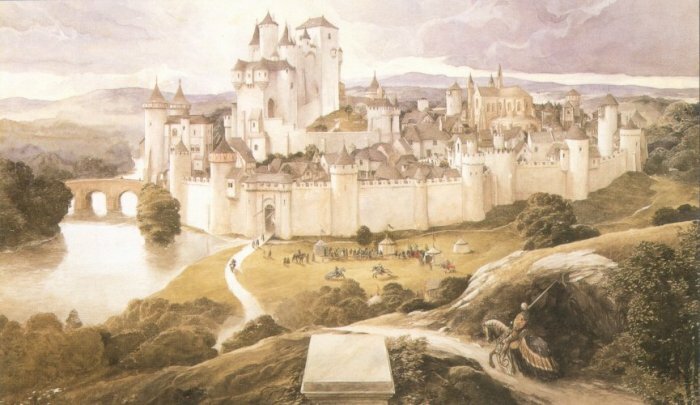 Camelot was the great castle of King Arthur. Camelot was the seat of power in Britain, where inside a council was established. Arthur and his knights who presided over the council were called Knights of the Round Table. Camelot symbolised the Golden Age of Chivalry. There was no Camelot in the early tradition by Geoffrey of Monmouth, Wace and Layamon. These early Arthurian authors say that Arthur's capital was in Caerleon (Caerleon-on-Usk). The earliest reference to Camelot I could find comes from the French poet named Chretien de Troyes. At the beginning of his romance, called Le Chevalier de la charrette ("Knight of the Cart" or "Lancelot"), Chretien say that Arthur was holding court at Camelot which was situated in the region of Caerleon. No other details were given. In about 1210, Perlesvaus (Le Haut Livre du Graal), the writer say that Camelot belonged to Alain le Gros, the father of Perceval. This section gives a summary of the popular characters in the Arthurian legend. Since the legend centred on the British king, I devoted a whole page on Arthur. There is also page devoted to the Knights of the Round Table, as well as a page devoted to the women who played active parts in the legend. Merlin and other notable characters can be found in a page titled "Minor Characters". If you have a question or a problem, your answer may be found in the Frequently Asked Questions (FAQs). Or go to the Contact page, and email me. Or go to the Contact page and email me. Searching for a character or story in the Arthurian legend? Why not use the siteLevel Search Engine. Remember that everything written on my site is copyrighted. Please do not copy anything without permission. This website should be used as a guide or reference for educational purposes or personal uses. Arthurian Legends is a division of Timeless Myths. Timeless Myths and the Arthurian Legends were created by Bladesmaster. To read about other mythology, like Classical, Norse and Celtic myths. Return to home page, by clicking on this link: Timeless Myths.